Argentina Cavalry (Fatigue Cap-1) [AC-04] - $7.20 : Grenadier Productions,, Home of Liberators! 6 troopers & 6 horses. 2 poses each. Troopers wear fatigue uniform of coat & fatigue cap, armed with sabers. 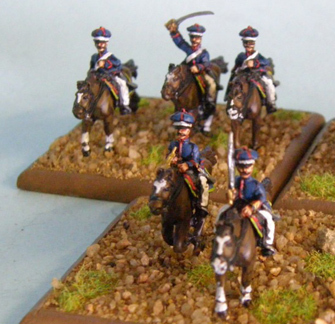 Use these figures for the Granaderos a Caballo (Horse Grenadier) Regiment. These figures are in a fatigue uniform according to a contemporary illustration of the regiment in service in Peru 1820. 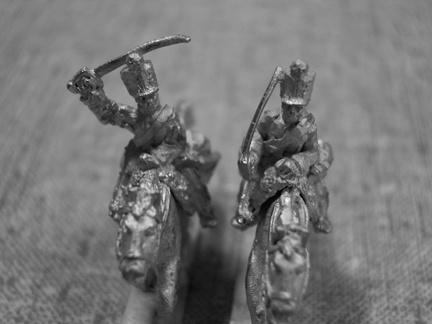 Use for any scenario featuring the Granaderos a Caballo but preferred for Peru and Ecuador 1820-1824. These figures can also be used for the Caballeria de la Patria Regiment (1810-11), Dragones Ligeros de la Patria/Ligeros del Peru Regiment (1811), Dragones de la Patria Regiment, Dragones de Plaza (1815) or Husares de Tucuman Regiment (1816). 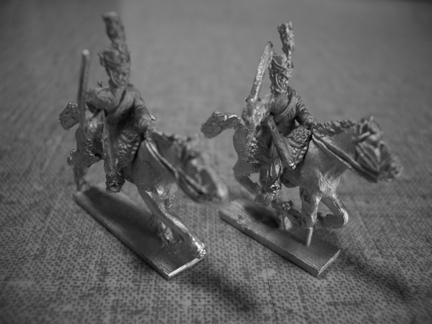 They are also suitable for "campaign look" cavalry from any faction, including Spanish/Royalist!